Riace, a small town in southern Italy perhaps best known for the Riace bronzes, two splendidly well preserved life-size Greek bronze statues that were found in the Mediterranean sea off the coast there, is making history of a different kind these days. “…immigrants are actively encouraged to come to Riace, where the mayor has created a special scheme for them. Today more than 200 refugees from a dozen countries work and live side by side with locals. 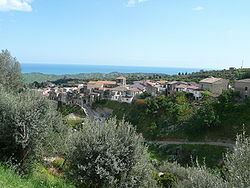 Riace is just a few miles from the coast, perched on top of a hill above fields full of sheep and groves of orange trees. It is a beautiful village of 1,700 people but for decades several houses have lain empty. The occupants left to build new lives elsewhere, in the north of Italy or travelling as far as New Zealand, Argentina and the US. The Italian daily La Repubblica writes about the experiment of Riace and its successful integration of foreigners into the local social fabric. The article goes deeper into the social aspect of the experiment and it describes how integration is aided by a local currency, issued to the refugees. Translation (not really quite verbatim): Sepp Hasslberger. Riace: Mahatma Gandhi’s image is printed on the 50-Euro notes, Martin Luther King’s on the 20s, Che Guevara and Peppino Impastato share a place on the 10s, and the great heart of the local villages livens up the papers of 1, 2 and 5 Euro. It’s the local money issued by the mayor of Riace, Domenico Lucano, to help the refugees. In this town, Eritreans, Ethiopians, Somalians, people from Ghana and Afghanistan, as well as Palestinians and Serbs are living peacefully with each other and with the Italian locals. Not only are the foreigners welcome here, they are actually wanted here to help the town stem the loss of population and save it from social decline. Refugees in small towns. The situation here is different from other nearby towns, where things aren’t as harmonious. 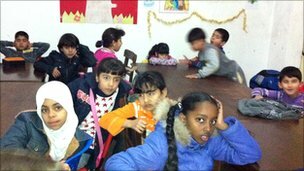 With a population of only 1800, Riace has given a place to stay to 230 refugees and asylum seekers and it has done well with it. Providing a roof and sponsored work to these families of foreigners, the town has avoided having to close its schools for lack of students and it has given life to many of the houses that were abandoned by their former owners who emigrated to far away places like Canada, Australia and Argentine. The newcomers are sustained by laws that help refugees and asylum seekers. The idea of a local currency. But the people repopulating the town arrive long before the money which the state has promised to help take care of them. “There is a delay of 6 or 7 months” says mayor Lucano. To bridge this bureaucratic delay, which doesn’t consider the necessities of daily life, the first citizen decided to create his own money. He had the notes printed up with the images of social and political figures he liked and then gave the money to the refugees, who are using them to buy things in the town’s local stores. The shop keepers collect those papers like meal vouchers and then later on, when the federal money has arrived, cash them in at the municipal treasury. 200 Euro a head to sustain life. “We are using this system to sustain the local economy” – says the Mayor – “and we’re granting a certain autonomy to the beneficiaries. This is very important for human relations in town. Also, our expenditures become very transparent and easy to verify.” The refugees have the right to receive 200 Euro a week for their expenditures. That means a family of four has 800 Euro to arrange their life and they don’t have to pay rent. It’s all paid in local money – it’s almost like saying Riace is the dream island, a place where a house is found for those who don’t have one, where living together is possible despite differences of language, culture and religion, and where – when there is no money – some is printed up instantly. A workable model – savings for the state. This one is a very important example because it demonstrates that, even before the “solidarity village” was constructed in Minea, the system of asylum in Italy was working, albeit with many limitations. The recipe was to integrate small groups of refugees and asylum seekers, distributing them all over the country, in agreement with the local communities. The major advantage of the system was that costs for the state were kept low. Jct: Good for Mayor of Riace, Domenico Lucano! But the decisions that I’m faced with are an ugly trap. But interest on city’s debt is always number one. Unhappily, which projects live or die’s my only say. Why shouldn’t government be one to try it out as well? We’ll test to see if LETS Greendollars are a better way. Including only principle without the interest. Could LETS Greendollars help reverse project abandonment? We’d have some cash left over which is something rarely seen. For services, we’d levy tax at end of every year. For assets, tax to pay depreciation. It’s so clear.